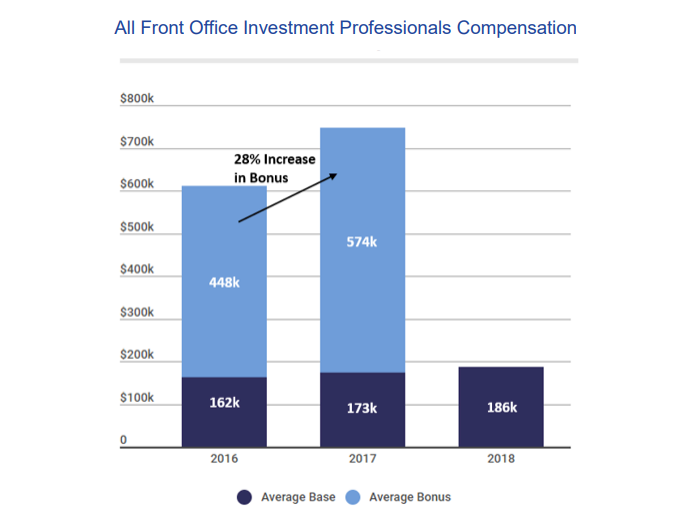 At year-end 2017, hedge fund investment professionals predicted that they were going to receive a 2017 bonus 39% higher than their 2016 bonus (as described in our Q42017 Compensation Report). Surely this was optimistic? A case of wishful thinking before the holidays? Hadn’t they read a newspaper recently about the hedge fund industry and understood what was going on with assets and fees? So earlier this year, we went back and surveyed the same 1,000 people about their actual bonus numbers. The overall findings are now in. Turns out the analysts weren’t off by a lot. The average hedge fund investment professional saw an actual 28% lift in 2017 vs. 2016 year-end bonuses, as illustrated below. 1. Positive average 2017 fund returns generated significant performance fees in addition to management fees. 2. The return of confidence within hedge funds has heated up the market for top talent between funds, driving up the cost of retaining key investment professionals. 3. The strength of the wider economy has created additional competition, with the fields of technology, private equity and private credit in particular looking to hire similar candidate profiles.